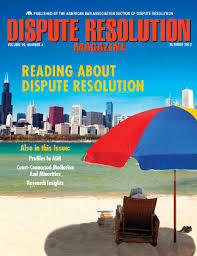 This review of Lainey Feingold’s book, Structured Negotiation, A Winning Alternative to Lawsuits, was published in the Summer issue of Dispute Resolution Magazine, a publication of the Dispute Resolution Section of the American Bar Association. It is available in PDF format on the ABA’s website. Structured negotiation is a systematic framework for resolving legal claims. Its approach is predicated on the belief that by using an agreed-upon, repeatable structure for discussing and addressing legal claims, stakeholders can, without filing a lawsuit, equitably and cost-effectively resolve their concerns. This text crystallizes the required process steps. It begins with the deliberate choice of the process title, “structured negotiation.” Unlike collaborative law, structured negotiation does not require participating counsel and parties to sign a Participation Agreement that precludes those attorneys from representing their clients in subsequent litigation should negotiations not succeed. Though litigation is always a backdrop possibility, structured negotiations occur with the plaintiff’s commitment not to file a lawsuit as long as party negotiations are in progress. To enhance the probability of initiating and sustaining negotiations, participants systematically embrace a vocabulary, conduct, and commitment that support transforming potential adversaries into partners. The initial communication, carefully crafted, is an opening letter, not a demand letter. Participating advocates propose explicit ground rules for negotiation to stabilize communications and minimize gamesmanship; they conduct collaborative meetings to share information rather than pursue discovery or conduct depositions. It is demanding for both the advocate and the client to remain committed to the process. Challenges abound: if one’s negotiating counterpart does not provide a response within the agreed-upon time frame (e.g., 30 days), should you assume a negative response and declare the negotiations over? Be patient for a few days, thinking that the delay could be for understandable reasons, not just “negotiating gamesmanship?” Or pick up the phone or send an e-mail with an inquiry? How should you respond to a request to add new claims or parties to the conversation? What is the most desirable way to use the media to advance, not undermine, the negotiating goals? This is a brief review of Lainey’s book first published in the Dispute Resolution Magazine. The magazine is a print and online publication published by the Dispute Resolution Section of the American Bar Association. Back to the top of this post.